L: 59" x W: 18" x H: 38"
Corina Bedroom Dresser If you love the look of traditional design, then the Corina bedroom dresser may be the one for you. Pilaster and acanthus accents and antiqued brass-tone bail pulls and knobs are all hallmarks of European styling in your newfound classic. If you love the look of traditional design, then the Corina bedroom dresser may be the one for you. Pilaster and acanthus accents and antiqued brass-tone bail pulls and knobs are all hallmarks of European styling in your newfound classic. L: 59" x W: 18" x H: 38" Weight: 138 lbs. • Birch veneer and hardwood solids. 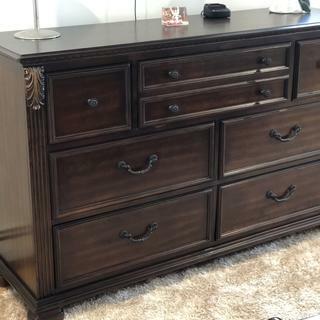 • Drawers have bead frames. Drawer boxes are French/English dovetail in a natural color and use a center metal glide system. • Drawers have ornate bail or knobs in an antique brass color finish. I'm Highly Satisfy! I love my Corina Style furniture! Thank you Raymour and Flanigan! I love my Corina style bedroom set. It's a true beauty, the affordable price I paid, I got more value solid , hard wood dresser with deep drawers and plenty of room for my clothes. I like the new and antique style, that suits with any age and taste. I love the color it matches my curtains and my rugs and makes my bedroom more glamorous and romantic. My daughter told me that I made a good choice and good taste to pick the color. I have been it to many different furniture store and came out not liking their style, color and the price too expensive and cheap quality. Raymour and Flanigan has good quality, stylish furniture at a great price. I'm really happy what I have. I give a 10 Star. Highly Satisfy ! Perfect size for my NY bedroom. Not very deep but the drawers themselves are high, so it can hold a lot. Beautiful and excellent quality. I do not regret getting this and will treasure it for many years to come. It’s a beautiful dresser a little bit darker then the picture shows but it matches perfectly with my furniture. I got all my furniture from Raymour and Flanigan love this furniture store. I love it this dresser it’s beautiful and it was a very fast delivery. This is a very beautiful set. It looks larger in my bedroom than it did on the show room floor. I love it so much! I would definitely recommend it. So many drawers it has and they seem to be very firm and long-lasting! It is a beautiful piece. Good size drawers. There is dovetailing in the back of the drawers but the front joints appear to be stapled/ glued. The wood in the drawers is not the thickest, maybe a quarter inch or so. We will see how they hold up. Seems to be good for the price though. Does the dresser come with mirror? I don't see matching mirror for this. Is there one? BEST ANSWER: Unfortunately,the Corina Mirror is not available for purchase.